A straw draw has denied the conservatives overall majority in the Northumberland County Council election. A total of 34 seats out of a possible 66 are required for a party to claim total control of the council. With 33 seats, the Conservatives only needed one more to claim total control of the council. South Blyth was the final seat to be decided. After two recounts it was confirmed that Conservative candidate Daniel Carr and Liberal Democrats hopeful Lesley Rickerby received an equal amount of votes, resulting in a draw. A draw of lots was done to decide which party would win the South Blyth seat. Ms Rickerby called the experience "very traumatic" and said she was in no rush to repeat what had happened. "It's unbelievable that when you consider we have a democratic service that we end up having to draw straws," she said. "It was very traumatic and I certainly would have preferred it to be a majority, but the way our system works, after a couple of recounts, we had no choice. "The returning officer decides if we would flip a coin or draw straws and he went with straws. "I felt if I did it I was choosing my own destiny but I cannot deny it was very traumatic. "When you enjoy doing something like representing people I would have been very disappointed to lose it that way. "I'm certainly don't want to do that again in a hurry, it really was the last straw." Labour suffer a disappointing result in the Northumberland County Council elections, losing 7 seats, while Conservative gain 13. The main road route in and out of the town will be shut until mid-July, although pedestrian access will still be possible. Northumberland County Council has in the last few minutes approved plans to move its HQ from Morpeth to Ashington, forcings its 1300 staff to transfer their base. Our news correspondent Dan Ashby is at the council meeting and has confirmed the decision, revealing also that Northumberland's existing county hall will be demolished and the land sold. Dozens of parents protested outside County Hall in Morpeth, over plans to charge over-16s for school transport in Northumberland. From September, most students between 16 and 18 years old will be charged £600 to use school buses, and will fund their own public transport costs. The demonstration took place before an extraordinary meeting of the council. It debated a motion put forward by the Conservative group leader, Cllr Peter Jackson. It called for the change to be suspended and for more consultations with parents. The motion was narrowly defeated by 34 votes to 30. The Labour controlled authority says the council must reduce a £3.3m bill for post-16 transport. "In difficult times, we need to be focusing our resources on those who are in greatest need. We've listened carefully to what the public have had to say, not just today but throughout the consultation period, but the bottom line is we have to balance our budget." The Labour group said the cost of arranging today's extraordinary meeting came to £80,000; a figure disputed by others. "I think people had to have their say. People have got a democratic right and right across Northumberland, families and young people are struggling with this new six hundred pound, effectively, tax to go to school. They had to be heard and their concerns had to be heard and addressed and I think it was the right thing to do." A policy of scrapping free school transport for 16-18 year olds in Northumberland is being challenged at an extraordinary meeting this morning. Parents and students will protest outside County Hall in Morpeth as opposition councillors force a debate with the Labour administration. 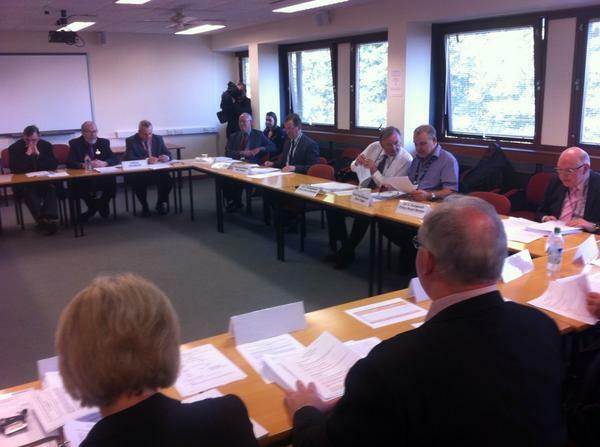 The council's ruling group has voted to introduce the policy as part of a £32m pounds programme of budget cuts. Some students and their parents say the move will severely restrict their educational options. Ovingham bridge was designed to support horse and carts and is struggling to cope with more modern transport.